September was steady at Wild Bird Rescues with 30 birds needing help. Swans topped the list, as they often do, with 13 adults attended plus several cygnets (only a couple of those cygnets are included in the rescue numbers). Next was everyone’s ‘favourite bird’ with 4 ibis needing help. Then came a mix of the usual suspects … pigeons (feral and native), maggies, plovers, turkeys and even two water dragons which featured in one of my Facebook posts. Last month I warned that you’d been very lucky to escape stories and pictures of ibis in the August Report. Not so lucky this month! First, I tender this evidential picture which clearly shows the superior intelligence and high IQ of ‘our favourite bird’. 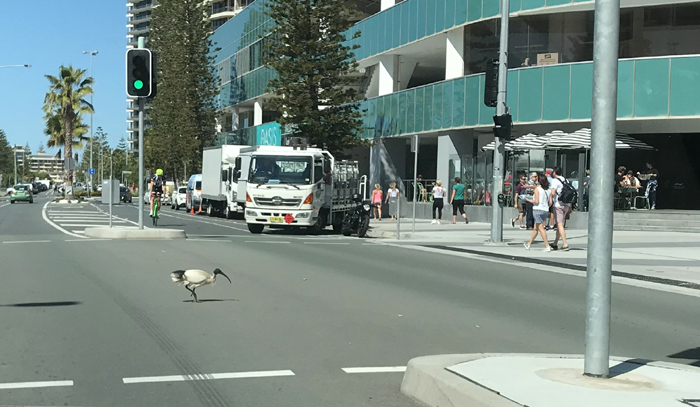 This one was crossing the road at the lights in Broadbeach. She waited and only stepped off the curb when the walk light turned green. But unfortunately whoever controls the timing of those lights hasn’t taken into account the shortness of ibis legs or allowed for the extra time they need to cross. A dangerous oversight I think you’ll agree. As a consequence the walk light turned red before she was across. Did she panic? Noooo, of course not. Despite the very real risk of being squashed by that large truck pulling out from the curb she calmly sauntered over and made it safely to the other side. Children and teenagers could learn a lot from ibis. Ah Fishing Line, Don’t You Love It? Next is a sad little bird suffering from the bane of all ibis … discarded fishing line. She was called in by Brooke and her husband Daniel who were camped in the Broadwater Tourist Park, Southport. Brooke had thrown the bird some food and noticed it was limping and had fishing line trailing from one of its feet. The other foot looked to be completely missing. 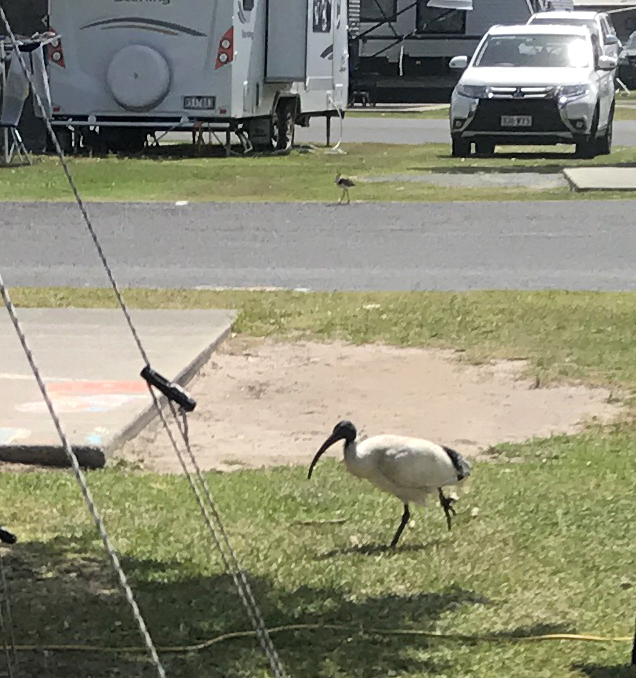 Pic at right shows the ibis holding up her foot due to the pain of a fishing line entanglement which threatens to cut off her one remaining ‘good’ foot. To describe ibis as opportunistic (I prefer the word ‘intelligent’ … but then I am biased) would be an understatement. Needless to say this bird was back for food the next day. Entanglements cause so much pain that ibis will turn up anywhere they’re likely to get a free meal that doesn’t involve walking. After two days the bird was camped out behind the couple’s tent. When Brooke called me the first thing she said was, ‘I didn’t even know there were people who would help ibis’. Well, yes, the less said about that the better. I’m still not convinced the words IBIS HUNTER on my resume is a good look. It took me a few trips to the park before I caught her. She was very lucky because as you can see in the pic at left she’s already lost all of the toes on one foot to a previous entanglement. 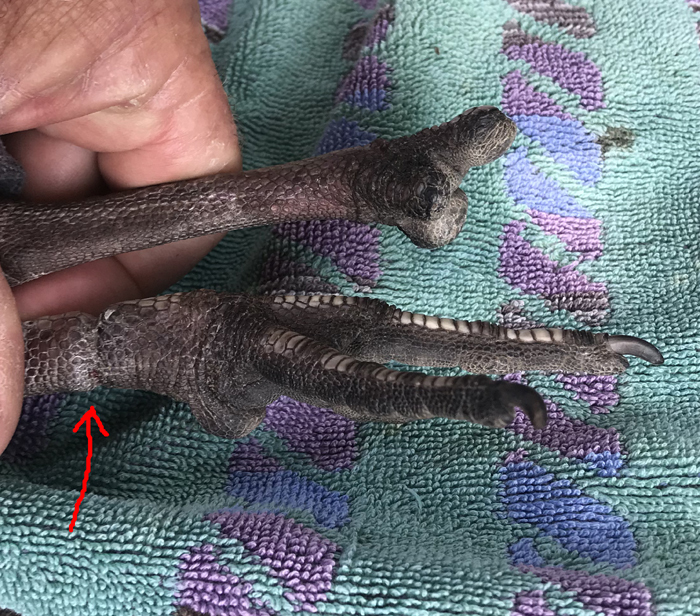 I’ve cut away the new line and the red arrow points to the compressed ring of skin where line was wrapped tightly above her ankle. A couple more weeks and it would have amputated that ‘good’ foot, leaving her with just half of one functioning foot; a hopeless situation. Unable to forage she would have slowly starved. It’s gratifying to see any injured bird go from barely walking to strutting around looking like they don’t have a care in the world. Such was the case with this one. When Daniel released her she flew a few meters then landed and walked away. We all commented on what a remarkable transformation it was. Much more comfortable now and none of the agony she was suffering just 10 minutes earlier. Late one arvo, while driving around Doug Jennings Park at The Spit, I spotted another ibis holding up it’s leg. Inspection through binoculars revealed one of its feet was hanging from an ankle by skin only. Oh crap. No fixing that. Immediate euthenase. Despite my best efforts I was unable to catch the bird. That’s not unusual. When they’re really distressed and in a lot of pain they won’t allow anyone near. Nor can they be manipulated with food. I checked again the next morning but there was no sign of the bird. Two days later I got a call from Christina, a girl who lives on a houseboat in ‘Bum’s Bay’ at The Spit. Christina is one of my ibis spotters from way back. She told me she was feeding an ibis which had a foot barely hanging on by skin. I was there in a jiffy. I don’t know what caused the break. Might have been a car strike but more likely fishing line. Closer inspection revealed that a small part of the injured ankle was still intact. There was no saving the foot but if the creature was lucky the stump of the ankle might heal sufficiently to allow it to hobble along effectively. We decided to leave the bird and see what developed. Sure, it would be in great pain but help is not available for an ibis in that condition; euthanasia being the only option. I’m sure if we’d told the bird about that it would have laughed and flown off immediately. Despite the dreadful injury I thought the stump had about a 50% chance of coming good, ibis being ‘as tough as an old boot’. Delighted to report that four weeks on the creature appears to be doing quite well. Christina has monitored and fed it and said the foot dropped off a few days after that first sighting and the stump appears to be healing and the creature can weight bear upon it. So far it looks like a very good result indeed. 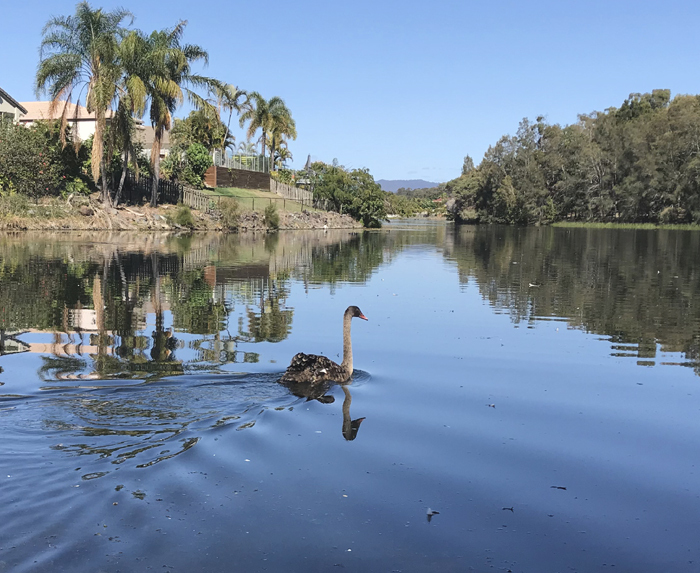 Residents in Runaway Bay are both amazed and delighted that a pack of some 15 swans have recently turned up on their canals. Don’t know where they’ve all come from but with so many being born then forced out of the parental territory when they fledge it only takes one group of youngsters to land and then be joined by another group and soon you’ve got a whole flock. The call had come in about one of those birds seen holding up its leg with a long length of fishing line trailing behind. Residents managed to keep it and several other swans around with food during the 15 minutes it took me to get there. The target bird would have been an easy ‘hand grab’ except for another dominant swan which kept chasing all the others. At times like that evil thoughts creep into my mind and I fantasize about catching the nuisance bird and wringing its neck. Mind you that wouldn’t look too good on my resume either. I was getting nowhere and so decided to blow a net over the entangled swan. Lousy shot. Bird got under the net. Gone. Rats. That’s not how it’s supposed to be. It was late arvo. No time to lose. Frustration was kicking in, not helped by a stream of ‘helpful’ advice coming from one of those people standing around. Luckily the bird hadn’t bailed after the first net shot. I quickly reloaded and got off another shot, this time successfully. She was a very lucky girl. 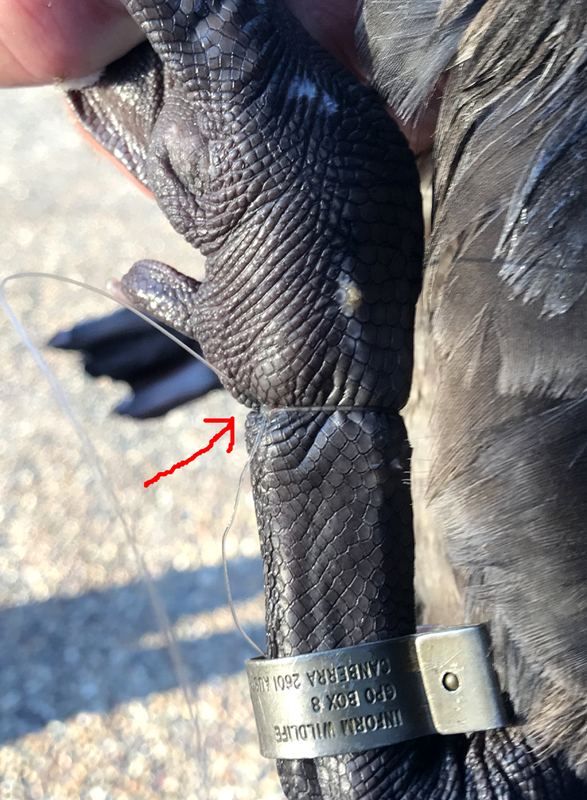 A single wrap of fishing line was causing acute pain and had turned her lame. Like the ibis mentioned above it was the dreaded ‘above the ankle’ wrap … the type that readily cuts off a bird’s foot. It’s rare for a swan with only one foot to survive, they’re just too heavy. To make matters worse kids who’d seen the long length of line trailing from the bird had grabbed and pulled on it. That’s fatal. It tightens the line and causes an embedded hook to lodge even deeper. The line then breaks and the bird swims off, now in real trouble. It only took two seconds to snip off that one wrap of fishing line (pic above left). A quick massage and almost instantly she regained use of her lame foot. There was no need for further intervention and so I released her immediately. I had a lucky escape one afternoon when a rescue didn’t go so smoothly. 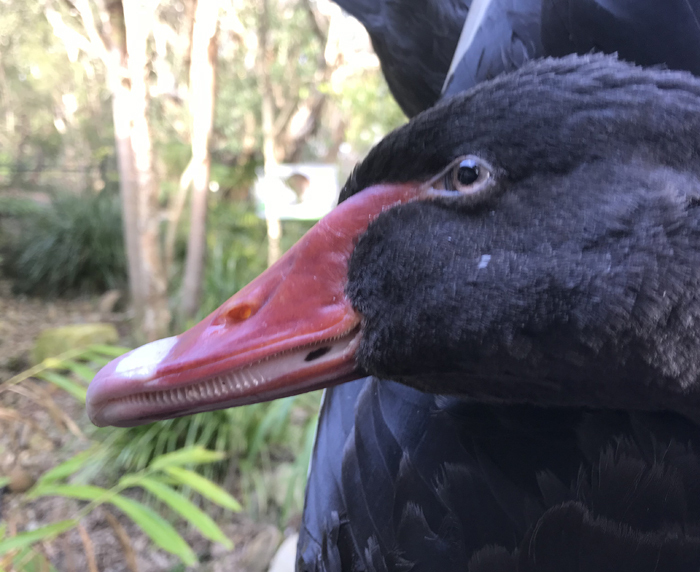 It involved another of the Runaway Bay swans; this one with a rusty, long-shank hook lodged deeply in the back of his jaw. Ouch! 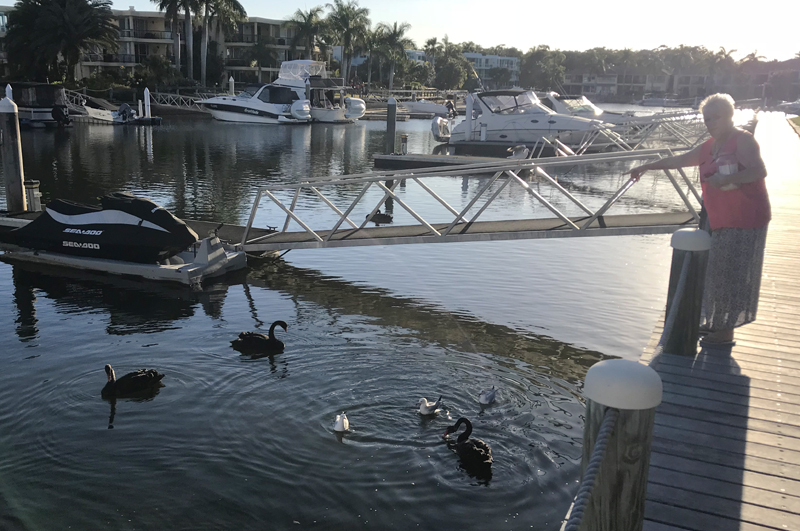 The bird had eluded me all morning, then later that afternoon a call came in from Coombabah about a swan with a hook in its face. Could it be? Coombabah is several k’s from Runaway Bay and not accessible via water. The bird must have flown. I arrived and sure enough the creature fitted the description. My first thought was how gratifying it is knowing that so many people want to help injured swans. I wished more would report injured ibee. Be that as it may three callers had reported this hooked swan from two different areas in the space of a few hours. The swan was wary. It was shaping up to be a tricky catch. I moved to the park next to the callers house, quickly laying down my long handled capture net before the bird got a look at it. Then I used food to attract the creature the 20 meters over towards me and the net. After a bit of juggling I lined him up and took the shot, but he saw the net coming and scrambled to get under it. 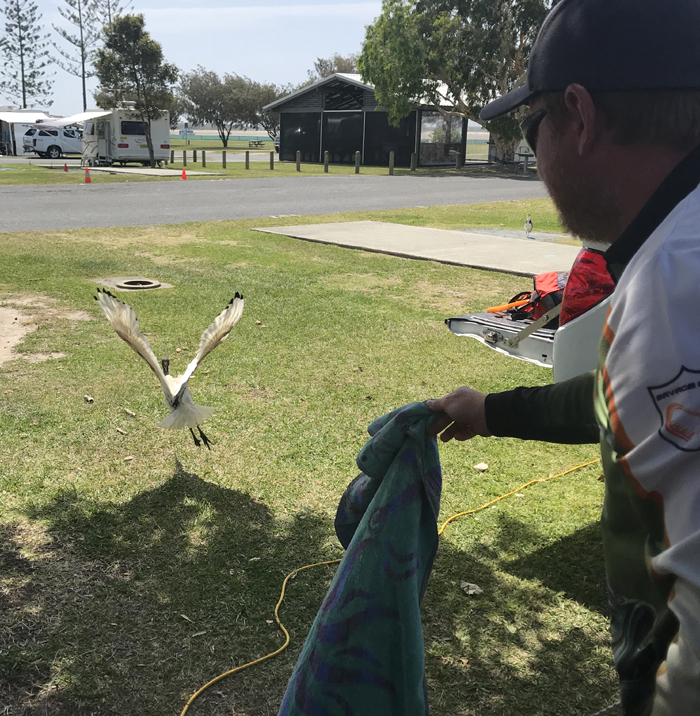 I had him, but only just and so jumped from the wall down onto the adjacent boat ramp and took a step forward into the water all the while keeping max pressure down on the net head trying to hold the flapping bird inside. Stepping onto a boat ramp is dangerous at the best of times. I once saw a friend break his arm as he slipped on a ramp. 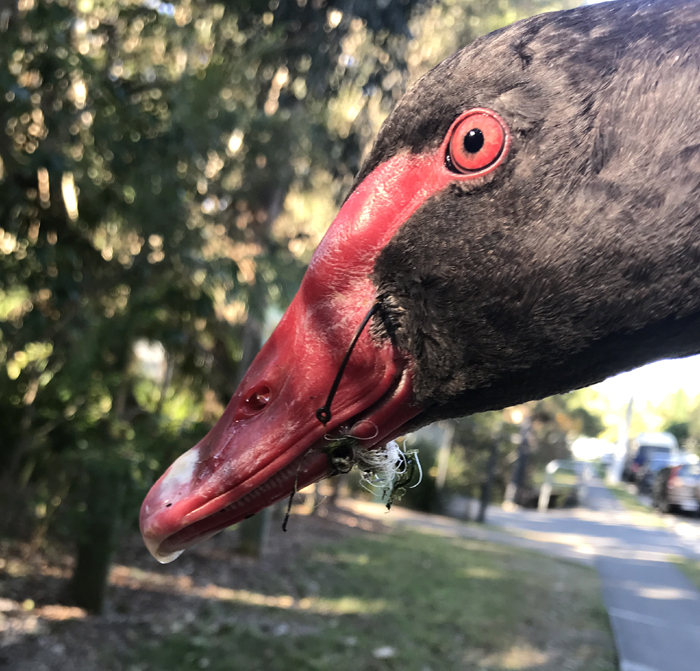 And … walking onto a slimy boat ramp is a particularly bad idea if you’re in a hurry and have a panicking bird in your net. Next thing both feet went out from under me as I slid into the water and came down hard on my back, then went further over cracking my head on the concrete ramp. The creature was still in the net, which was good. I didn’t feel too damaged, which was even better. Careful not to slip again I slowly hoisted my sopping carcass out of the primordial slime, not relishing the idea of having to rummage through capture gear in the back of the car to find my least ‘ibisy smelling towel’ and dry off. Fortunately the callers, who’d seen it all and were standing there open-mouthed, took pity on me and offered a shower and clean towel. I think they were impressed that I still had the bird. 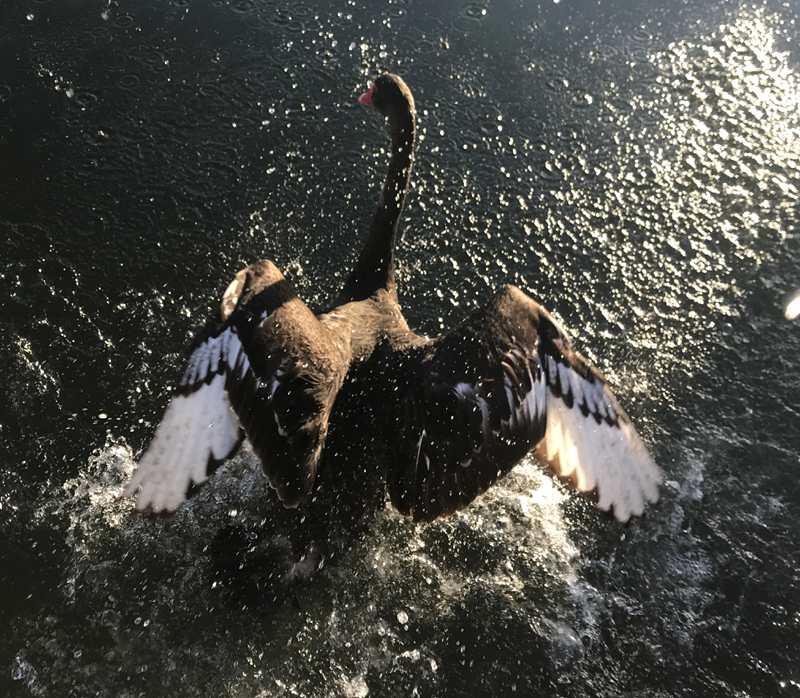 First thing was to box up the swan, then I headed for the shower emerging ten minutes later feeling clean, warm, relaxed and with little more than a few scrapes, a broken net and an egg on the back of my head. After that it was off to hospital with the creature to have that very nasty, life-threatening hook removed from its jaw (pic above right). The picture at left of Kate Nespeca appeared in the Gold Coast Bulletin. I am seriously impressed by her ‘take no prisoners’ attitude towards cake. Well, not cake exactly but rather Nutella (near enough I reckon). Kate says she’s a Nutella addict. I like her style and can imagine her doing serious damage to a nice piece of chocolate gateaux. 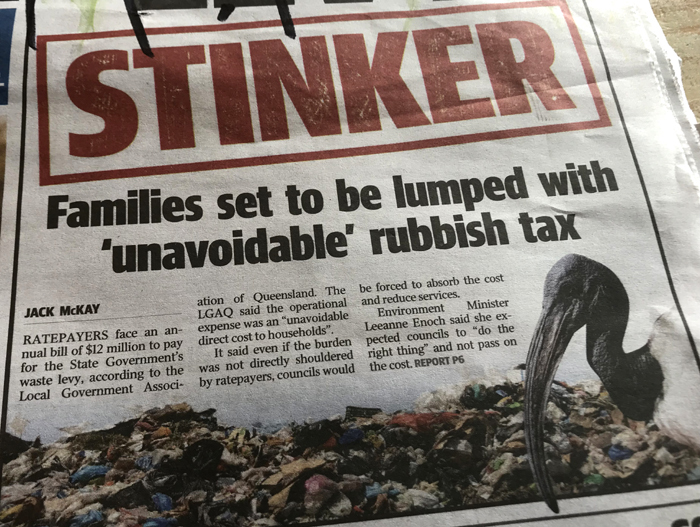 Far less impressive, or should I say downright despicable, was the use of a photo of our ‘favourite bird’ in a recent article about rubbish. Last month saw the passing of Serena (at right), the matriarch of Lake Hugh Muntz in Mermaid Waters. Serena and her partner ruled the lake for almost 2 decades and raised countless offspring, many of which had been helped in one way or another by Wild Bird Rescues. This year had been tough on her. First she’d lost her long term partner after he was clipped by a car. The damage was minor but it revealed a deep and irreparable wing wound which we suspect he’d sustained some weeks earlier in a fight with another swan. He couldn’t be saved. 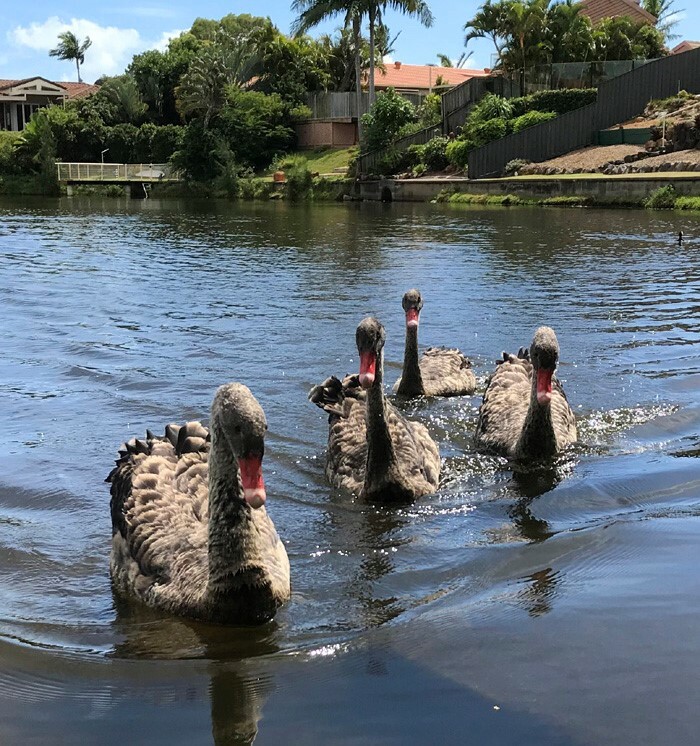 That left Serena having to fend off attackers from her current brood of four 12 week old cygnets which I eventually relocated to Southlake, Robina (pic at left). After the relocation Serena left the kids to get on in Southlake returning sporadically to Lake Hugh Muntz, her long-time home. In recent months she’d spent more time there but lately had become listless and would not accept food from locals some of whom had known and cared about her for years. We suspected she was dying, which in fact she was. The decision was made to allow her to remain hidden in comfort among the reeds and let nature take its course, but an attack by a younger invader left her traumatized and resulted in me running her to hospital for a check-up. This would also provide her with much needed peace and quiet. She never made it, dying a couple of minutes before arrival. Serena is missed by local residents. 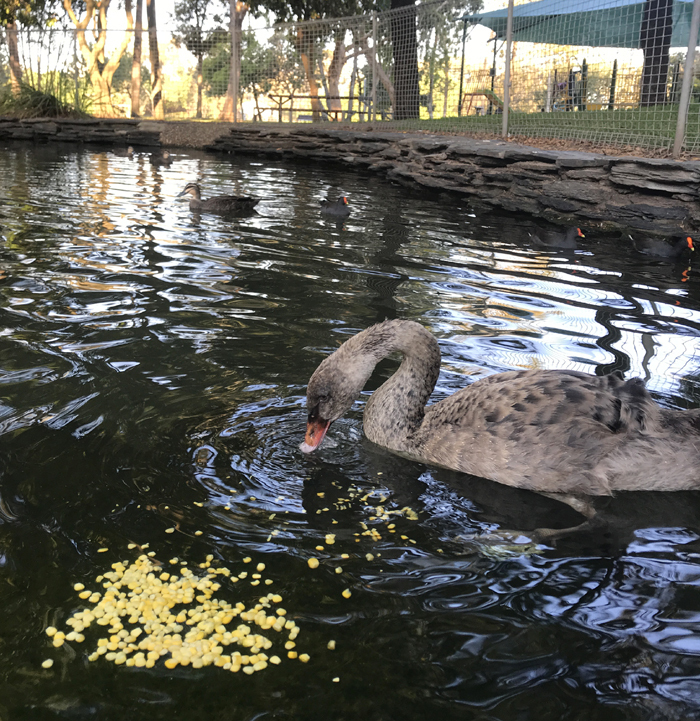 As revealed in the last report I’ve had two cygnets in care for the past several weeks in a pond on Macintosh Island (Surfers Paradise). The older bird Bruiser is four weeks senior to young Willy and recently had begun testing her wings and attempting to take off. There’s not enough take-off room so I knew I had to release her quick in case she flew headlong into the pond’s 1200mm high surrounding fence. Bruiser was released the next day on Westlake, Robina, (pic at left) which is fresh water; something she’d never experienced before. Westlake has abundant natural water weeds and grasses and is populated by ‘mostly’ friendly swans. Bruiser was nervous as she headed out. That’s unusual but it was probably due to surprise and confusion about her new surroundings. I haven’t had any reports about young swans in trouble since her release, so I’m sure she’s doing fine. In the meantime Willy’s now alone in the pond. Not that that will bother him because he’s spoiled rotten with a 6am breakfast of lettuce and fresh corn from me, then another breakfast of lettuce and grains from manager Mark a few hours later, followed by more lettuce and corn from me around 4pm. Goodness knows what he’s being given in the meantime by passers-by. Soon it’ll be hard to distinguish him from a beached whale. Pic at right is Willy ‘the whale’ getting stuck into his fresh corn. I have to stand guard, all the while getting mauled by sand flies as he eats, otherwise the other birds (ducks, water hens, pigeons, ibis, a peacock and a turkey, which have recently inhabited the previously bare pond, try to steal his food. Shortly after you read this report Willy too will be out in the wild. It’s a tad early because he’s only 13 weeks old and not yet ‘flight capable’, but I’ve seen them fly as young as 14 weeks and easily by 16 weeks, so he’ll be fine. I want him out before the GC 600 car race next week. Roaring cars will be passing a mere 40m from his pond. These have been just a few of the 30 stories from September. Most had a happy ending. Not all of course because this is wildlife rescue. Often the best we can do is to reduce suffering which is something we’re nearly always able to achieved. I’m delighted to report that Wild Bird Rescues is in good shape financially with sufficient money in the kitty to meet expenses. Thanks go to all donors and to our patron Jim Downs and Liz and Paul on the Donations Committee.